The essential components of a DSLR include the shutter. The shutter opens when the shutter button is pressed and the camera is able to record the light coming through the lens. Click to see large version. The shutter is the camera mechanism that opens and closes exposing the image sensor to light from the lens. When light passes through the lens it is focused on the ‘focal plane’. 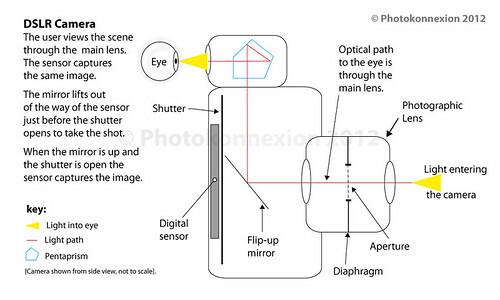 In a digital camera the focal plane is the sensor. Most modern DSLRs use a type of shutter called a ‘focal plane shutter’. The shutter curtain is very close to, and directly in front of, the focal plane. Without the shutter a constant stream of light would be coming through the lens and hitting the sensor. There would be no control over the exposure. The shutter opening and closing determines the length of time that light is allowed to reach the sensor. There have been a range of designs and materials used in shutter construction. Most DSLRs use two ‘curtains’ to cover the sensor. During a long exposure, one shutter curtain opens exposing the sensor to the light. Then, after the right amount of time the second closes behind it. For a high shutter speed both curtains work together. As the shot is taken the first curtain opens a small amount. Then after a tiny amount of time the second curtain follows it. They both move across the sensor at the same speed creating a slit which scans across the sensor. The gap between the curtains determines the amount of light reaching the exposed part of the sensor. As the slit passes a point on the sensor it is exposed to the light and that point (pixel) gathers the data on the incoming light. A bigger gap between the curtains means a longer exposure for any given point on the sensor. The shutter can be made from any moveable cover that can be used to cut off the light. Shutter blades, a plate or a fabric curtain have all been used. Modern DSLRs normally use blades or plastic curtains which move up or down. This ‘vertical focal-plane shutter’ gives more precise control of exposure than a horizontal focal plane shutter. This is because the vertical shutter covers the vertical axis of the cameras’ landscape view quicker than moving across the longer horizontal axis. In older SLRs the shutter was opened by a mechanical system. It was powered by the action of pressing the shutter button itself or a spring actuated by the shutter button. The modern shutter is opened and closed by servo-motors and springs. The camera controls them by the Integrated Circuit Chip. The latter controls shutter functions based on calculations for the required exposure. Exposure times for any given point on a sensor can be measured as long as minutes and seconds… or as fast as thousandths of a second. Modern cameras have very high speeds. This means the control of the shutter curtains must be very precise. Motor accuracy as well as time accuracy is precisely controlled by the main integrated circuit chip. Do you know what your DSL Shutter is Doing?